This savory salmon salad has the perfect mixture of barbecue and citrus with a little added tarragon to make this meal worth making over and over again! In a shallow glass baking dish, combine the bbq sauce and salmon. Set aside. In a large bowl, combine lemon juice, honey, salt and pepper. Peel apples, core, and chop. Add apples to lemon-honey mixture and toss. Add cranberries and tarragon. Preheat broiler or grill. Grill or broil salmon fillets until fish is opaque in the center and flakes off with a fork, but don't overcook. Break apart salmon into bite size pieces and toss with apple-cranberry salad. Enjoy! If you'd like a printer-friendly version of this recipe, Click Here. 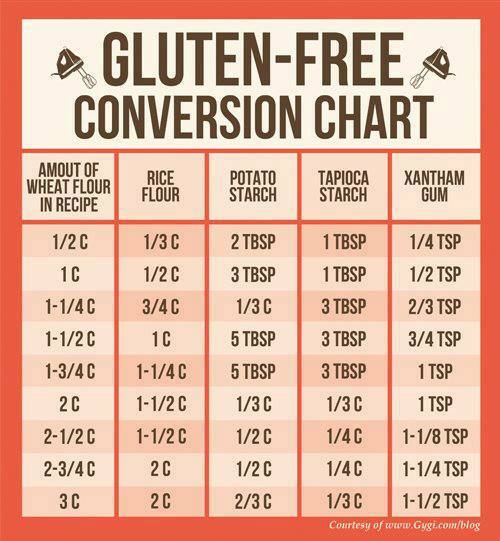 Found this conversion chart for any of my followers with gluten allergies. Hope it's helpful. Just a fun grill to cool off your hot summer festivities! Using a few blueberries for the charcoal and wooden skewers for the grill grate, place your favorite fruit kabobs on the grill and share with family and friends! 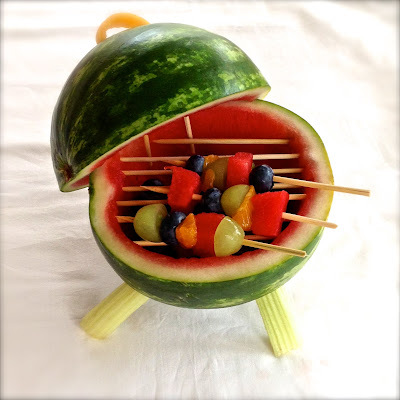 Great for cookouts, parties, or any fun summer get-together. Move over eggplant parmesan; there's a new cheese in town and it's taking over! This healthy and savory recipe only takes minutes to make but is an absolute restaurant-quality dish! Heat olive oil over high heat in a skillet. Place sliced eggplant in skillet and season with salt and pepper. Turn down heat to medium-high and saute' eggplant on both sides for just a few minutes. Remove skillet from heat. Place sliced tomato and sliced mozzarella on eggplant and cover, so the mozzarella will melt. Open steak roll and toast. Cut each half of the roll in half again (each roll equaling 4 servings). Place an eggplant/tomato/mozzarella on top of each toasted roll, spoon 1 to 2 Tbs pizza sauce over the top, and add fresh basil. Enjoy! If you'd like a printer-friendly version of this recipe, Click Here.